Here is yet another imperial IPA to be reviewed on Beer O'Clock Australia. If you haven't guessed yet this is my favourite style of beer. If you don't understand the fascination with IPA's you really need to try some, you WILL fall in love with them! In terms of it's appearance Evil Cousin appears to be quite a standard looking IPA. The body is a deep orange colour with a small-medium off white head sitting on top. I can't see a heap of carbonation however the head retention is good and the lacing is worldclass. Extra points for the label design as well which is pretty cool. When you give this beer an initial smell you can tell that this beer lives up to expectations and is a huge hop bomb. The nose is almost entirely made up of very bitter grassy hops. Naturally there is a little sweet malts towards the backend and some hints of citrus, but this is almost entirely overpowered by the hops. Hopefully it tastes as good as it smells! Contrary to what the nose indicated this IPA has quite a large amount of sweet malts up front before the hops take over. They are of both pine and grassy varieties and provide slightly less bitterness than anticipated, however that is a comparitive measure as it is still 100 IBU! The carbonation is average and the mouth feel is quite nice as well. There is nothing really exceptional about this IPA but as a collective it comes across really well. It's one that will more than likely end up back in my fridge. 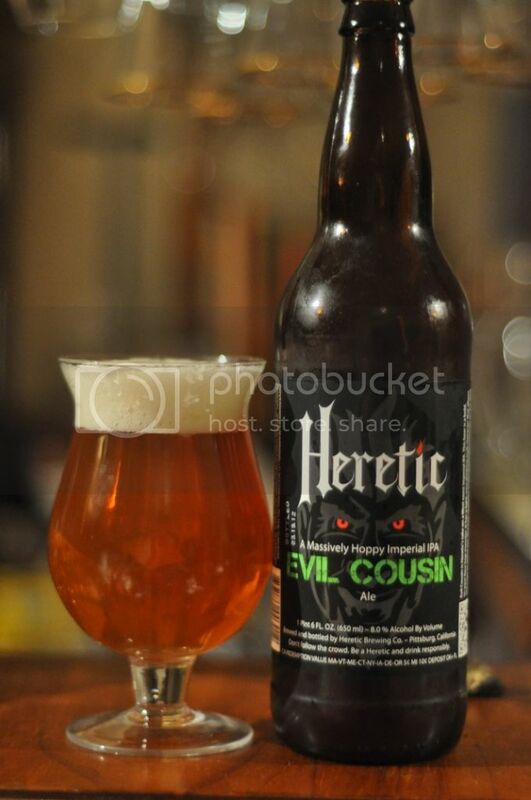 The name Heretic having given this beer, Evil Cousin, makes it an obvious present for that cousin we all have. The beer is actually a really pleasant example of an Imperial IPA and one that could turn people into bonafide IPA lovers. It's on the lower end of the ABV scale for an Imperial IPA, at 8%, and this really increases the drinkability of this one. Heretic's Evil Cousin is a beer I would recommend to all, it would also make an awesome present; guess what your birthday present is Mo!